If you are a landlord, you have come to the right place to get help. 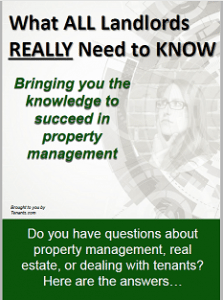 Being a property manager can sometimes be a daunting task. Dealing with maintenance issues, tenants late rent payments, answering to owners, finding the right accounting software, and showing property to new prospects. Here you will find book on the best landlording practices and techniques, training DVDs, videos and other helpful material. If you have any other landlord resources material that you would like to share, please let us know! Get the free eBook "What ALL Landlords REALLY Need to KNOW"
Get expert advice and ‘hands on training’ from experts in the field. This eBook is complementary for you! It covers items such as getting started as a landlord, financial considerations, how to handle tenant problems, and much more. We are always open to suggestions on additional reference material. Please contact us if you have any other topics or videos that you would like for Tenants.com to publish. Please limit submissions to landlord books, property management guides and real estate investment advice.